How deep is your hidden life? You can’t control God and make Him appear. Your job is waiting. Your job is being. He is the One who comes and causes His will to appear. Will you be one that stands in His presence? “The Lord Jesus’ way of meeting His Father was a very Hidden Life. Alone, remote, and completely private. You could easily miss the constancy of His escape to prayer, so briefly is it mentioned, hidden even in scripture. He went up on the mountain by Himself to pray; and when it was evening, He was there alone. “That most essential center of Jesus’ life belonged exclusively to the Father. It was hidden from the disciples and it is hidden from us. He went away and hid Himself from them. 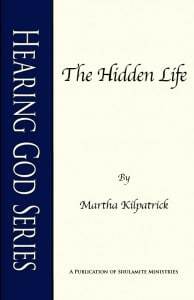 In The Hidden Life, Martha describes the radical, hidden life of prayer as exemplified in the lives of Joshua, David and Jesus Himself. The Hidden Life is now available in both print and digital format. The first 30 years of Jesus’ life are secret years, completely shrouded in mystery. Only one occasion of His boyhood has been recorded. Its significance, therefore, is all the more profound. Jesus at 12, in strange disregard of his parents’ anguish, disappeared from their caravan. For days they frantically searched for the Boy. But young Jesus was not missing, it was Mary and Joseph who were lost. Did they forget? He placed on them the burden and responsibility to understand His priority: His life was for and with the Father. He was the Father’s Boy, and in that episode Jesus revealed that He had passed from Boy to Son, from parents to Father, from human approval to God’s pleasure…and His guardians were not His owner. Jesus, the Son of God, possessed one loyalty. One Parent and One Love. Guardians only we parents are, mere watchers of our children’s divine emancipation. God’s children belong to the Hidden Life… Owned. Secluded. Unseen. When God has a special destiny for a person, He must hide that one unto Himself. David spent solitary years as a shepherd. In that hidden lonely life, he learned the nature and power of God. He learned to commune with the Holy One. Son of a father who ignored him and brothers who scorned him, David discovered a Father Shepherd—in all protection, provision and perfection. The boy knew God’s practical power in life crises. Let no man’s heart fail on account of him… The Lord who delivered me from the paw of the lion and the paw of the bear, He will deliver me from the hand of this Philistine. The Lord enabled David to do what cannot be done. He killed the bear and the lion with his HANDS! In the face of that, Goliath was no threat. Living in complete obscurity with God’s lively presence, changes take place in you that you will not comprehend. But when you are thrust out to be God’s conqueror, all the confidence and ability forged in the hidden adventure rise naturally to the fore. Just living as His servant, in whatever place He puts you, is to receive the essence of Him…without realizing it. When you spend time alone with God, His power enters you. You may not see it nor could you measure it. God gives strength to live in aloneness, satisfied with Only Him. It takes incredible power to be still and live a small life. Anyone can ‘go.’ Few can wait for the higher call. All of the work is on God’s side, all of it. That’s the secret of communion with God. You wait, He prepares. You go, He works. Just show up as His intimate friend, and the Lord will rule you and your situation. So all of the ministry was on God’s side, and the power in God’s hands. As my children grew, I could spend hours during the day with the Lord. But I came to see that the calling of the Hidden Life was to live like Jesus. In His incredibly busy years, Jesus rose early (as was His habit) and made His meeting with God while others slept. This is the divine pattern of a Hidden Life. I tried so hard to rise early. I wanted to; I knew from scripture that it was crucial to spend hours with the Lord before the hurry of the day. And that ‘early morning manna’ is where you eat your fullness of Him. For years I tried, succeeded in many days and failed in countless others. I share this only to help you come to this life, hidden in the night. It is absolutely essential. The Hidden Life requires hours and hours alone with God! But such reward! And it comes by prayer, not human strength. Gradually, the Holy Spirit took complete control. Now I am awakened very early, every night with rare exceptions. I have a strength that is not of me to awaken fully alert and spend precious time alone with my Lord. By the time a normal day begins, I have spent many hours with my God! The Holy Spirit has given the Hidden Life as a spiritual power, not a discipline for which I can take any credit. He will do the same for you, in you.